Previously, I successfully made sponge cake much to my delight. From that successful attempt, I have looked into making pound cake because they are a great treat with a multifaceted use. And bake, I did. 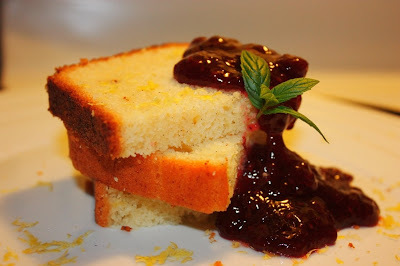 But for conversation’s sake, I have this idea of grilling or toasting slices of sponge cake before adding jam to it. Has anyone tried this? I would imagine that the slightly toasted and crispy exterior would provide a beautiful texture and flavor topped with some fresh berries or jam. Well, it would be an experiment for next time as I’ve run out of pound cake! This pound cake is a marriage of lemon and vanilla – both are classic flavors that are conventionally used individually but greedy me, I just had to use both. And they were perfect together. Unless otherwise stated, you must assume that I use real vanilla beans as I do not have vanilla essence at all. But you can definitely use vanilla essence because that’s what the recipe called for. Pre-heat oven to 350F and line your 9x5x3 inch baking pan with parchment paper and butter. Set aside. Sift flour, baking powder and salt together in a bowl for later. 2. Add eggs, one at time and mix until they are well incorporated into the mixture. After your second egg, you can add your lemon rind and vanilla beans in. Mix well before continuing with your eggs. You might find that your batter will start to separate when you add in your fourth egg in but don’t worry, this is perfectly normal. They will come together again when add your flour mixture. 3. Add your flour in three parts. You do not need to measure it, just eyeball the bowl of flour. This will ensure an evenly mixed batter. I would also suggest using a spatula now to mix the flour in to avoid over mixing with your electric mixer. Your cake is now done and ready for baking. 4. Pour the batter into the cake container that you’ve lined with parchment and greased with butter. Bake for 50minutes – 60 minutes or until the skewer you insert into the cake comes out clean. 5. Let the cake cool before cutting. Besides jam and trifle, i like dipping my pound cake in cold milk. Is that weird? ms.black: Ooohh…that sounds delish! Fruit jams on cake slices so does it for me, more so than on toasts. I must try toasting cake slices some day. Oh dear, I regret not trying more desserts in Dunedin – I think it must be because that one time we ate at The Reef together for someone’s bday we were too full from our mains…:P Or maybe our student budget did not permit! Microplanes are great for grating! 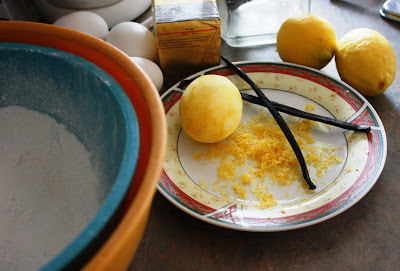 We also like to use orange zest in pound cake.